Perfect party food. 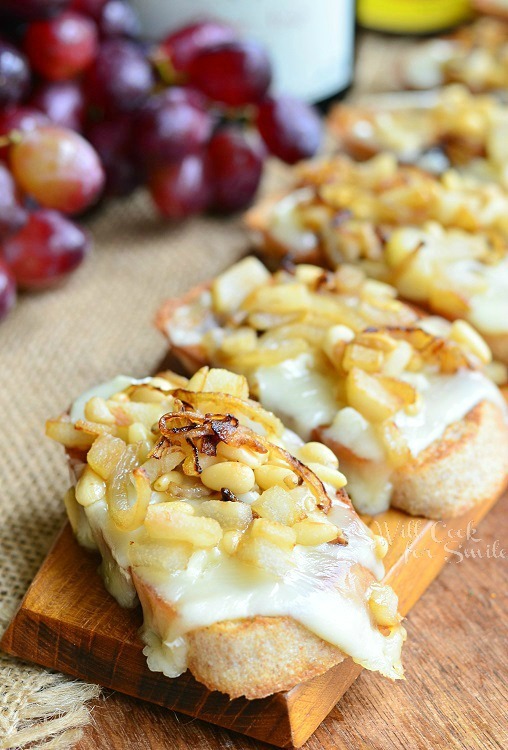 Crispy crostini tipped with gooey Brie cheese, sauteed onions, pears and pine nuts. 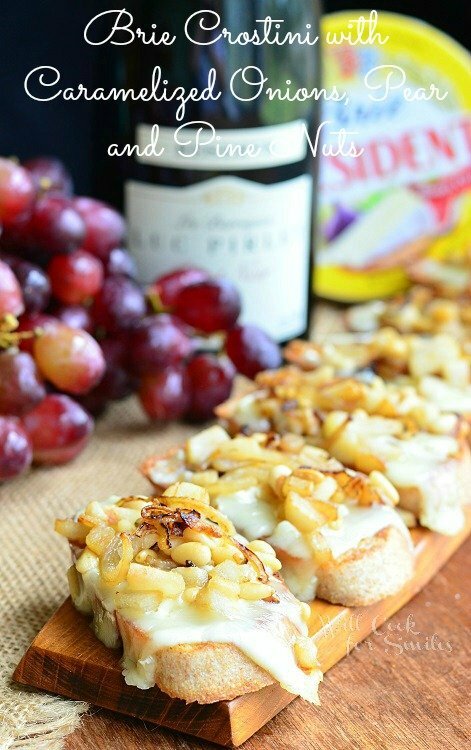 Today, I’m sharing a a great appetizer that would be perfect for a cheese and wine party or just an intimate date night. The star of the party will definitely be this Brie Crostini with Caramelized Onions, Pears and Pine Nuts. 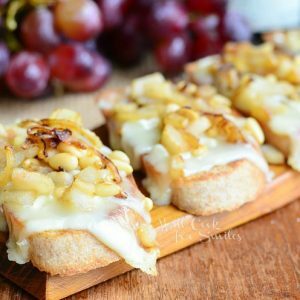 It’s an elegant crostini made with the perfect, creamy Président Brie and topped with caramelized onions and pears and pine nuts. The flavor palate of this appetizer is delightful. 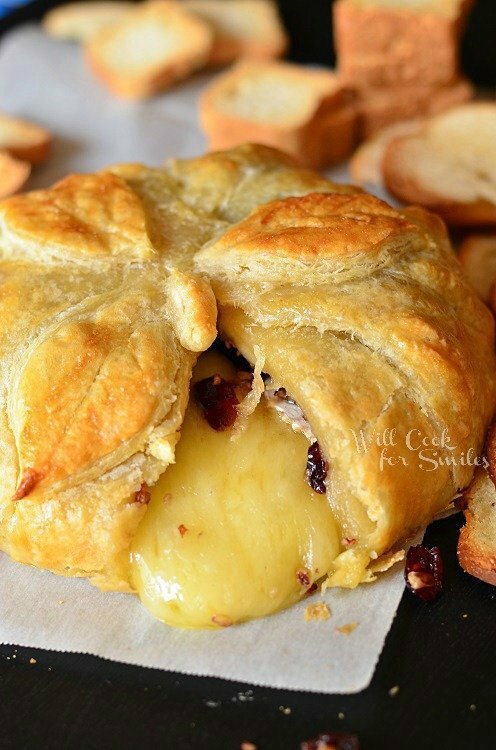 Caramelized onions go wonderfully with a slightly sweet pear and creamy cheese. Pine nuts just bring it all together in the end. Like I mentioned in my Cheese and Wine post, I prefer to cut off the rind and leave the soft, perfect Brie to work with. It is exactly what I did here. 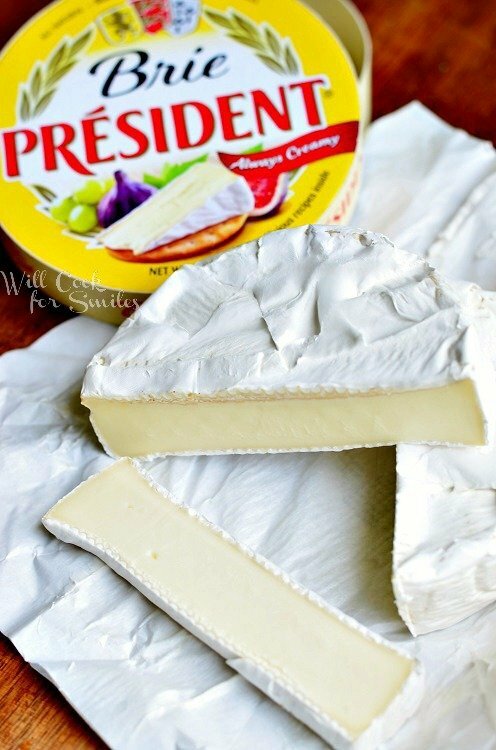 When I cook with Brie, Président is my go-to brand. I love the creaminess and the perfect flavor it is. They really know the Art of Cheese! Next time you plan a cheese party, make sure to check out these Cheese Party Basics from Président cheese. Don’t forget to visit their Recipes section. I’ve browsed this section for close to an hour. They have so many delicious, inspiring appetizers, it’s overwhelming! I immediately decided to make a crostini once I looked over their Brie recipes. 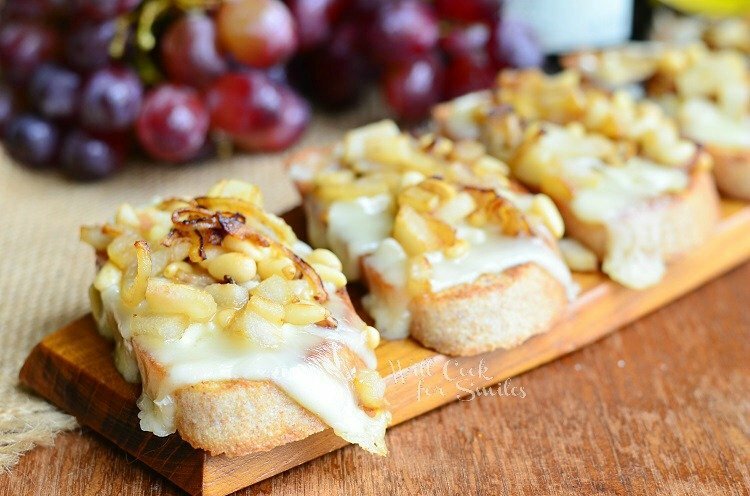 Crispy crostini tipped with gooey Brie cheese, sauteed onions, pears and pine nuts. Brush the baguette slices with a little bit of olive oil and bake them for about 8 minutes. Take them out and set aside. Lower the temperature to 375. In a small pan, saute sliced onion on medium-high heat, until it starts to golden. Add the diced pears and saute for a couple more minutes. Mix in pine nuts and set aside. Lay the crostini on a baking sheet, toasted side up and sprinkle with some salt. Thinly slice the cheese and divide among the crostini, on the toasted side. Divide the onion/pear mixture among the crostini. Fantastic!! I love cheese, I love pine nuts, I love bread, I love pears — well you get the gist. Put them all together and it is a fantastic appetizers. I will definitely add this to my recipe list. You are an inspiration as usual and your photos are out of sight!! You are multi talented!! When I studied in France, there may have a stint of time I practically lived on Brie! Thanks for sharing this! Ooo, I bet it was a great time! Thank you! Thanks again for posting such deliciousness! Mmmm I love all sorts of crostini! One of my favorite apps. 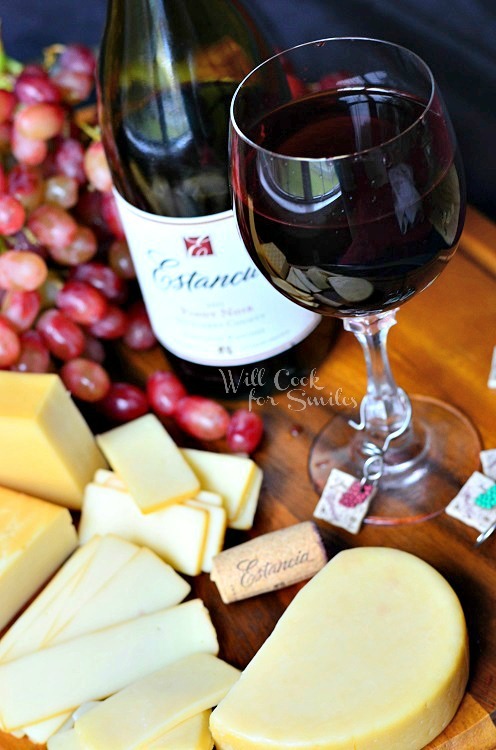 Love the flavors going on here… making crave a wine and tapas party! Thank you, Chris! These flavors really do go great together. Ohhh how I love brie. And pignoli. And bread. I need this now. Pinning! Yes you do 🙂 Thank you, Claire! This has got my name written all over it! I love this combo, and this type of recipe, perfect for anything~LOVE! This looks amazing Lyuba!! Brie is always a favorite of mine! These look amazing, Lyuba! I have some Brie in my refrigerator right now…just waiting to be used. Pinned! can these be made in advance ? I’m so sorry for a late response! Sorry, but these should be made right before serving. If you make them ahead of time, the bread would get soggy and cheese would not taste good cold. I just offered this appetizer to my New Year’s Eve guests and they devoured it. I added a bit more to the recipe; I added a few Craisins to the top for color and a short drizzle of white balsamic vinegar as well. I also sauteed the pine nuts in butter before adding them. What a show stopper recipe.